I hope that Supergirl's future self is not affected by the momma that she has after midnight-before 6 AM. That lady should not be a parent. It has been well-documented (through Facebook, Twitter, and on this blog) that my ability to effectually parent declines drastically after 9 PM, but based on the number of LOLs and lack of real people showing up at my house at 9 PM to take care of my non-sleeping child, I am starting to think that I am not being taken seriously. The following graph should help shed some light on the situation. 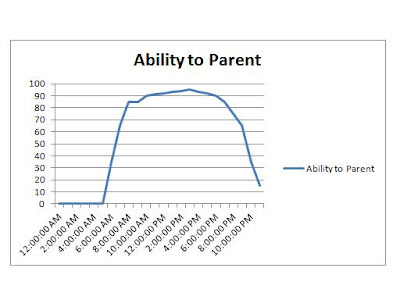 As you can see, I have no ability to parent from 12 AM - 6 AM. That is because I should be sleeping, not fetching f-ing water cups or being crawled on or having a conversation about why a pickle would not be appropriate to eat a) in my bed or b) at 2:17 in the morning. And the number of times that I have gotten up, fetched the water only to come back and find that there is no longer room left in my bed for me to sleep? It's a cold, cold world when the momma has to sleep on the couch. She is 4. Is it really so hard to stay in your bed all night long and not interrupt your momma from getting a few hours rest? Really? Also note, that my ability never quite reaches 100%. Even at my best, I am still lacking in the ability to parent my child department. 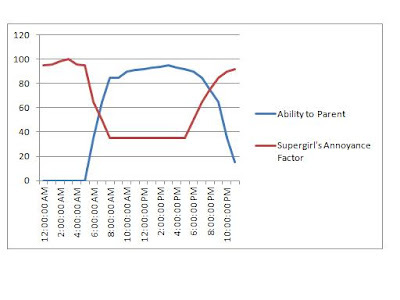 The next graph illustrates the Supergirl's ability to annoy throughout a given day. 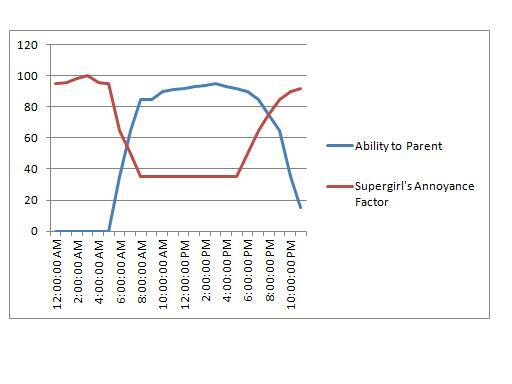 As you can see, during my "lacking" hours, the Supergirl is at full annoyance levels. That is because anything that wakes me during this period (snoring Hubs, scratching cat, the bear) is at full out annoyance level. During my "prime" parenting hours, while she still has some annoying tendencies that are right at the surface, they don't bother me nearly as much. The closer that she gets to 9 PM, the sleepier and more annoying she becomes coming to a full peak at about the same time that I have completely crashed. During her growth spurts, we have a fairly symbiotic relationship. She sleeps more, and readily goes to bed, she also eats more which means that there is not an hour long argument regarding dinner. Post growth spurt (where we are now) is not a good land to live in. I think the cat slept well last night.